Our Paint Pail Mittens follow a fantasy of dipping our fingers into buckets of bright paint. Sized for everyone from age 2 to men's large, knit them up for the whole family and make a splash! 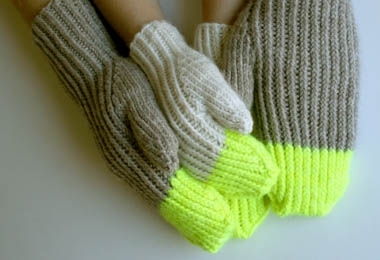 Choose to receive your Pattern as a PDF download or a hard copy, and for more information, including a list of materials you'll need to make your Paint Pail Mittens, please click Product Details, above. Main Yarn: We no longer carry the yarn we originally used, but an excellent substitute is 1 (1, 1, 1, 2, 2) skeins of Purl Soho's Flax Down, 43% baby alpaca, 42% extra fine merino, and 15% linen. Contrast Yarn: 1 skein of Madelinetosh's Tosh Merino, 100% superwash merino. We used the color Edison Bulb.